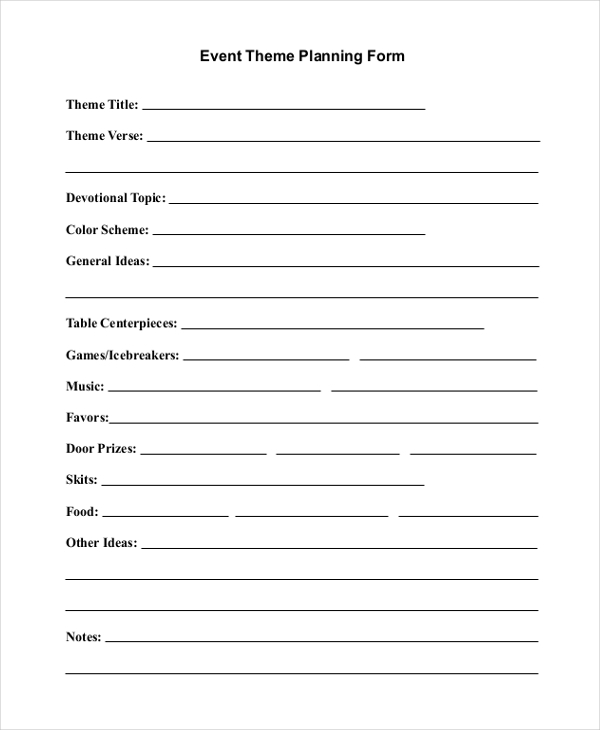 An event theme planning form is a basic event planning form wherein the event’s name, theme title, topic, color scheme, general ideas, table settings and details, music, activities and other ideas need to be populated. There is also a Special Notes section provided at the bottom of the document. Prior to organizing an event, event planning consultation also occurs. For this process, a specialized event pre-planning form is usually filled with relevant details regarding the event which has been planned. 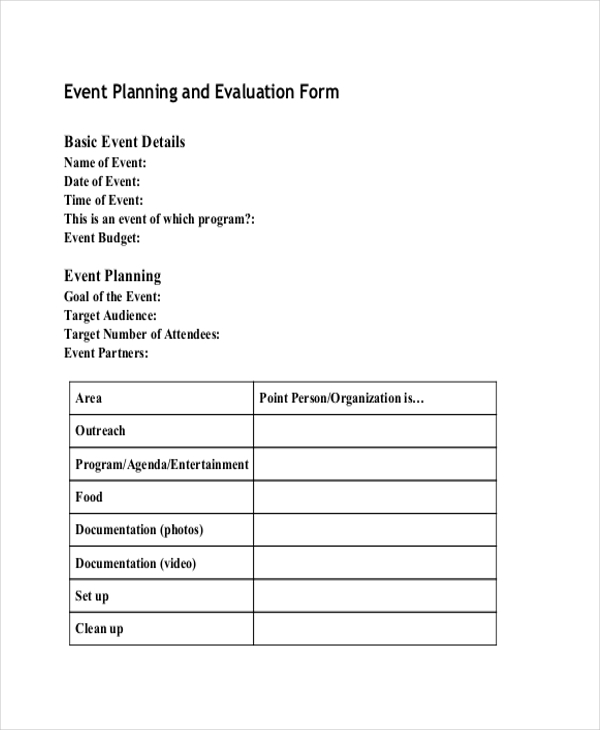 An event planning evaluation form contains a tables and questions that are associated with the event which has already been staged. Such a form can also be considered as a post-event form. 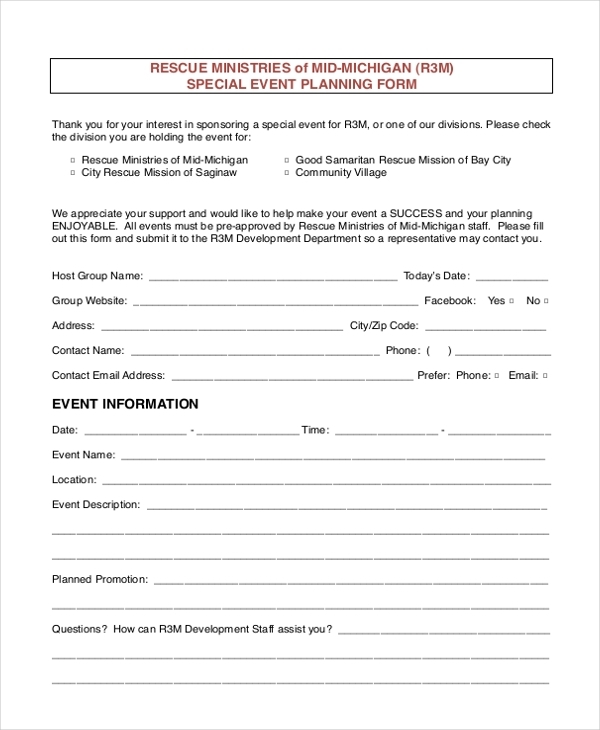 An event planning request form is handy at the time when a request needs to be filed for seeking approval and permission for staging an event. 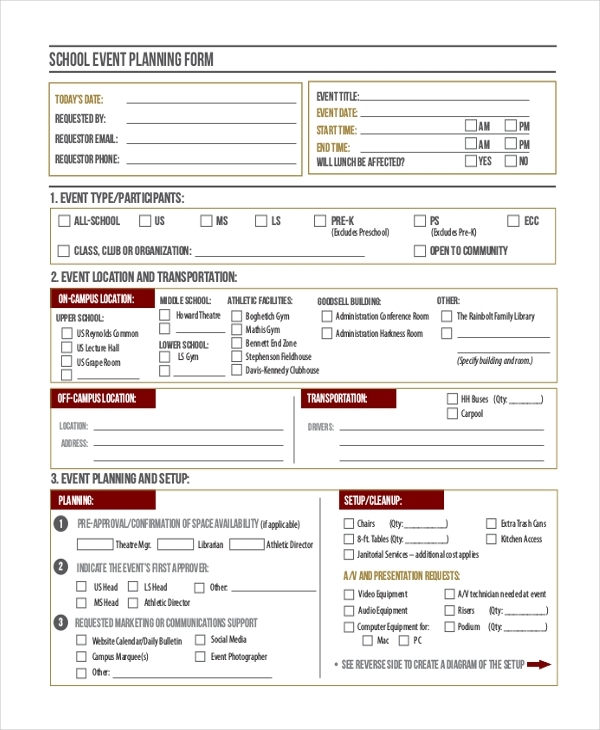 The fields required to be filled are similar to any other event planning form. 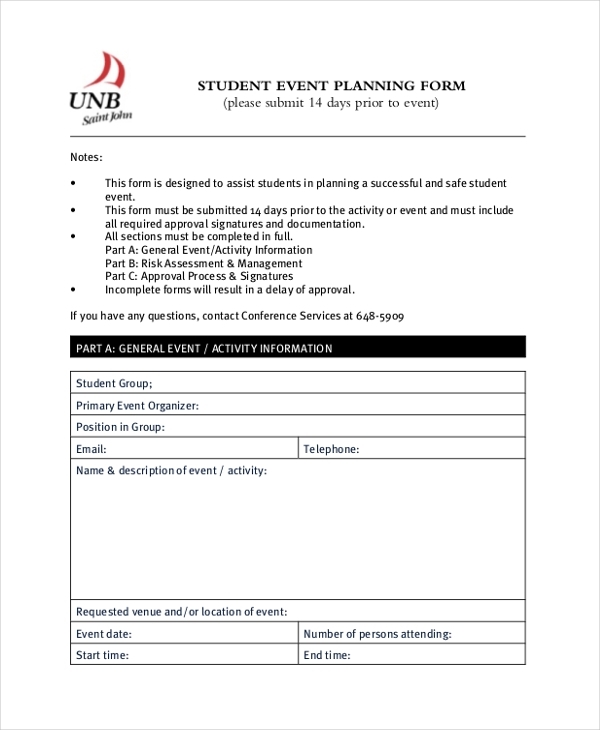 A student event planning form is suitably filled by student group or groups that are coming together to organize an event in school, college, university or in other foreign premises. Accurate details of the participating students, as well as the nature and genre of the event or activity, needs to be given in the form. Prior to planning for an event, many a time, authorities would like to be pre-intimated with the event details in order to give their consent for the same. 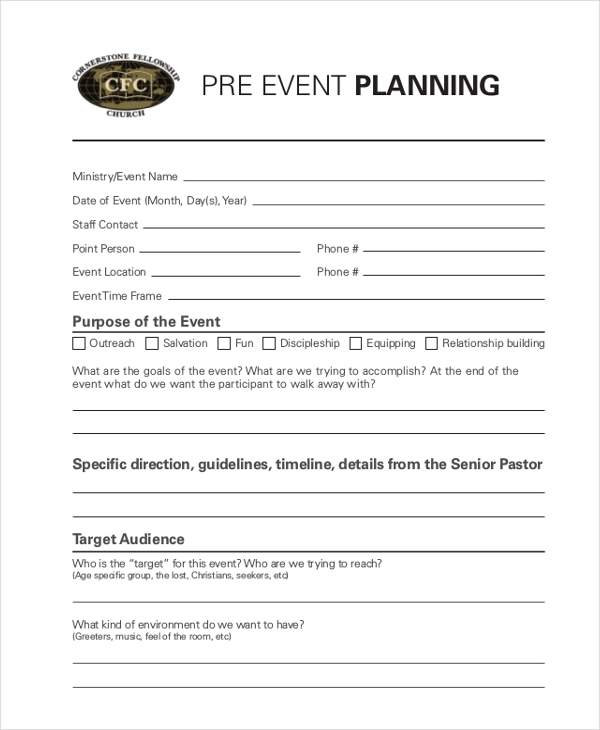 A pre-event planning form entails users to provide all the necessary information with regards to the event including the purpose of the event, specific guidelines, target audience and much more! 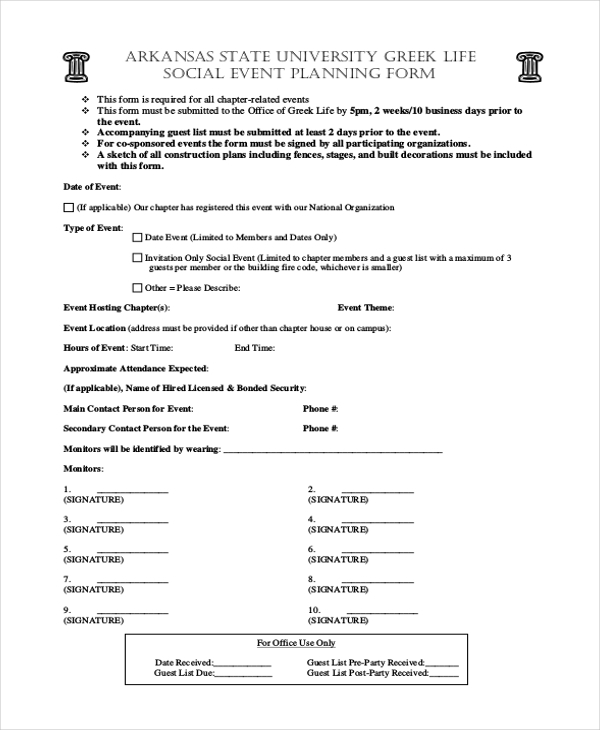 For the purpose of setting up social events, it is mandatory that a social event planning form is filled and forwarded to the concerned parties and authorities, briefing them about the different specifics of the social event. School event planning forms are used by school authorities prior to commencing the actual organization and staging of the event. The form must be populated with all the major and trivial information of the event. In the case of special, social or community event is in the works, the concerned authorities need to be sought and kept in the loop with all the know-how of the event – including date, time, venue, purpose, event name and description and much else. 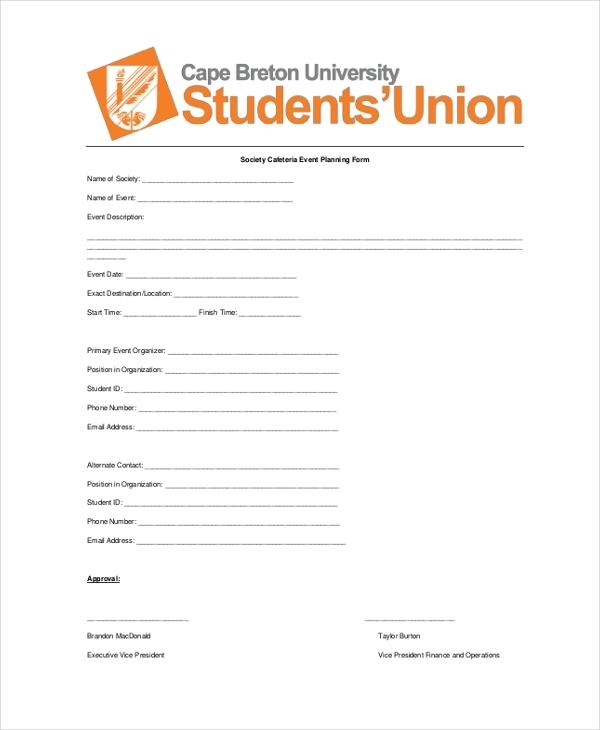 If a students’ association or union is hosting an event in school or college premises, an event planning form furnishing the details of the same needs to be accurately populated and given to the interested and concerned sections of authority. The target audience of event planning forms is the organizers and authorities which hold interests and stakes in the staging of a particular event. 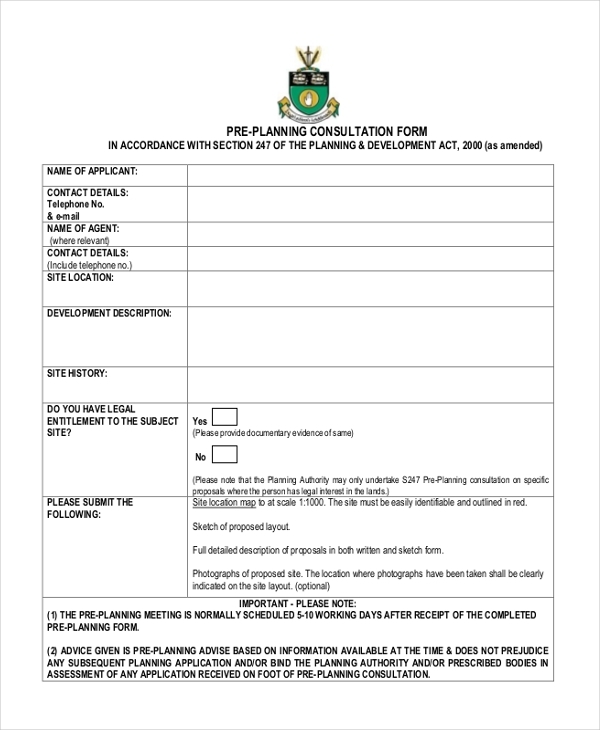 For security purposes and official reasons, event planners and organizers are encourages to prepare and submit an event planning and pre-planning form so that there are no loopholes or miscommunication or room for error in the planning process of any event. If any individual, group or company wishes to plan and organize an event successfully, it is best advised that they make use of event planning forms. They are freely available and downloadable and customizable from many websites on the Internet. 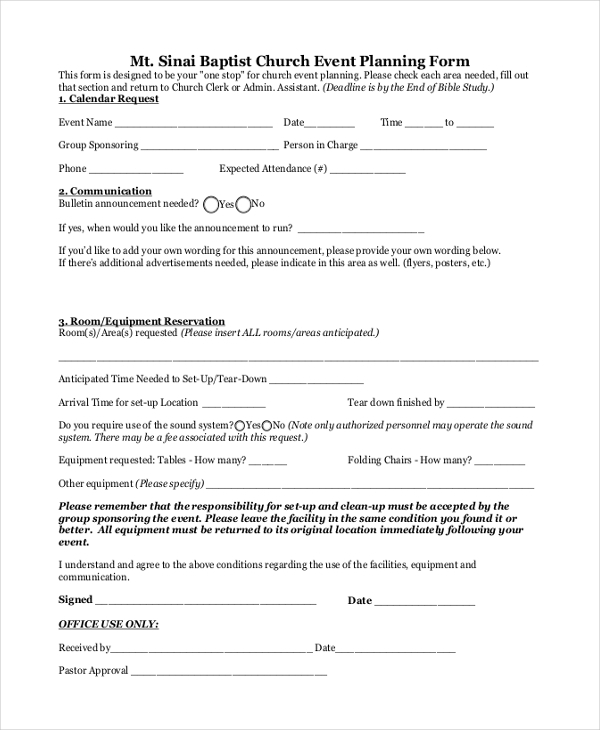 Make use and take advantage of event planning forms for the betterment of your event!